Major League Baseball is having a hand in more scripted shows these days, from its partnership with Fox on the baseball drama Pitch this fall to a new original series with AwesomenessTV. On Sept. 19, AwesomenessTV and MLB are launching a six-episode scripted series called Out of My League featuring social media stars Lauren Elizabeth Luthringshausen, whose YouTube channel has 1.2 million fans, and Brian Redmon, who has 580,000 YouTube fans. Los Angeles Dodgers center fielder Joc Pederson will have a cameo in the show, which is shot in and around Dodger Stadium and follows the courtship of die-hard Dodgers fan Claire (Luthringshausen) and Chase (Redmon), a surfer who's clueless about baseball. 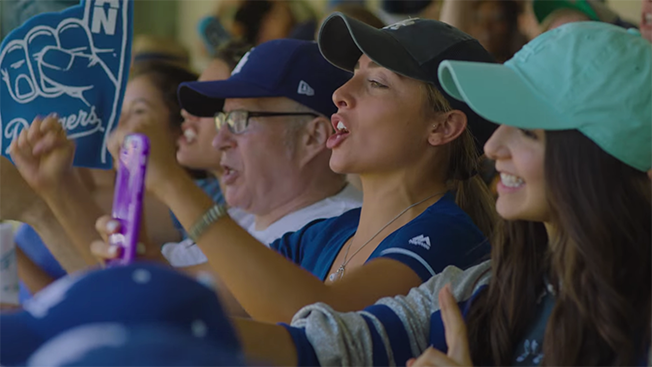 The series helps AwesomenessTV engage with its Gen Z audience in a new way and helps MLB appeal to a younger generation of baseball fans. "When we looked at potential partnerships, AwesomenessTV really stood out in terms of creating content that resonated with a younger audience," said Felicia Principe, director of brand advertising and marketing at MLB. "Through them and their influencer talent, we're able to tell a story that will resonate with Gen Z." Paul Kelly, chief partnerships officer at AwesomenessTV, said, "The opportunity to partner with MLB provides us with a way to elevate our storytelling." MLB's partnerships on the new series and Pitch, a drama about the first female pitcher in the big leagues for which it allowed real MLB teams and logos to be used and which it's promoting on Fox's baseball telecasts and during the World Series, are a creative way for the league to market itself, Principe added. "It's about engaging avid fans, casual fans and new fans," she said. "All of these types of content partnerships help us achieve that larger goal overall."